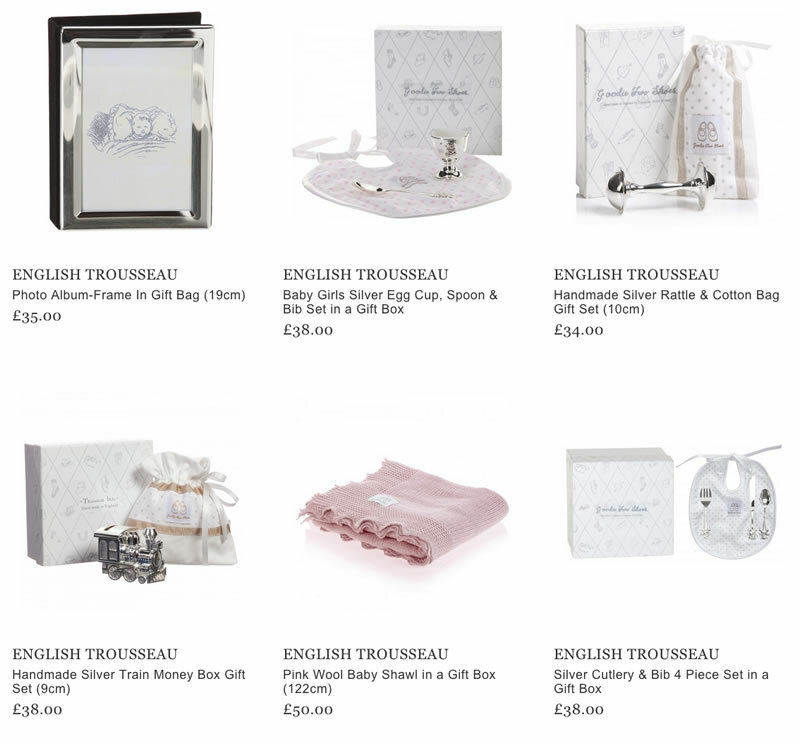 ENGLISH TROUSSEAU is a well-known British brand that offers a big variety of interesting gifts for young children. The company was appeared in 1988 in England, but today there are a lot of shops of ENGLISH TROUSSEAU in other countries of Europe, among them are Spain, Italy, Germany, France etc. The qualified designers of the brand work on each product during long time, as each item is made by hand and requires a lot of patience and special attention. But due to many opinions, the ENGLISH TROUSSEAU gifts are believed to be the best choices for newborns and toddlers. High quality is guaranteed. Silver egg cups, spoon & bib sets, silver rattles, wool shawls, piggy banks and other unusual gifts are made with great love for your babies. The manufacturers tend to use gentle and soft colors. The luxurious handmade will serve as a perfect present for birthdays, christenings and other special events and festivities. Nowadays the products from the ENGLISH TROUSSEAU line are available for purchasing online. The main feature of the manufacturers is to create lovely toys and accessories of a unique design, using innovations in technology. The creations of the ENGLISH TROUSSEAU brand suit both for girls and boys.